Starting from release 1.0.0.342 Notes Fields Extractor has two new options; ImageFileNameFormula and AttachmentFileNameFormula. With these options you can specify full Notes @-formulas, and use any field or other content in your documents in the formulas! For example, with the new release you can easily extract all employees images into a single directory, and each image has the EmployeeNumber-field content as the filename. Of course you have some extra run-time variables you can also use in your formulas, such as $(BASEPATH) which is replaced with the current base directory. Take a look at the updated User’s Guide to get an idea of how this works. Need to extract field content, including images and attachment, from Notes documents? 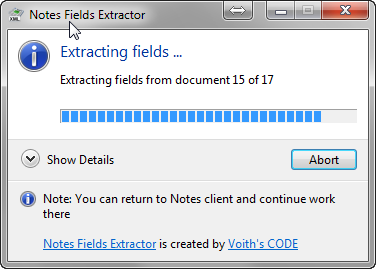 Meet the beta-version of Notes Fields Extractor! The Notes Fields Extractor is a small tool to extract field content, including imbedded images and attachments to your file system. Look at it as a programmable List Fields where you can mass-export document content. The output is at the moment XML files for all ordinary content, while images and attachments are stored in their own document-context directories. You may control Notes Fields Extractor from either Notes formulas or with LotusScript.